This file includes: From Mosses from an Old Manse, The Great Stone Face and other Tales of the White Mountains, A Book of Autographs, The Dolliver Romance (fragments), Other Tales and Sketches, Tanglewood Tales, and Twice-Told Tales (edition of 1889). According to Wikipedia: "Hawthorne attended Bowdoin College and graduated in 1825; his classmates included future president Franklin Pierce and future poet Henry Wadsworth Longfellow. 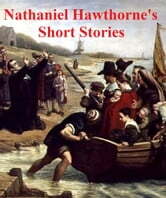 Hawthorne anonymously published his first work, a novel titled Fanshawe, in 1828. He published several short stories in various periodicals which he collected in 1837 as Twice-Told Tales. The next year, he became engaged to Sophia Peabody. He worked at a Custom House and joined Brook Farm, a transcendentalist community, before marrying Peabody in 1842. The couple moved to The Old Manse in Concord, Massachusetts, later moving to Salem, the Berkshires, then to The Wayside in Concord. The Scarlet Letter was published in 1850, followed by a succession of other novels... Much of Hawthorne's writing centers around New England, many works featuring moral allegories with a Puritan inspiration. His fiction works are considered part of the Romantic movement and, more specifically, dark romanticism. His themes often center on the inherent evil and sin of humanity and his works often have moral messages and deep psychological complexity. His published works include novels, short stories, and a biography of his friend Franklin Pierce..."